Kilkenny welcome four counties to Nowlan Park on Sunday next with the venue hosting the Allianz League Semi-Finals double header with Dublin taking on Limerick in the opener at 1.30pm, while Galway and Waterford will battle it out in the second game of the day at 3.30pm. Each team will be battling for a coveted spot in the Allianz NHL Final the following weekend. Tickets for the game are available at usual Centra and Supervalu outlets and online here. Pre-purchase tickets are €20.00. At the ground on the day; Adults €25, Students/Senior Citizens €20 and Juvenile's €5. Please note ALL Season ticket holders will be accomadated in Ardán de Grás for this fixture. There is limited availability in Ardán de Grás for this reason. Supporters are urged to purchase tickets for this stand as early as possible. Kilkenny season ticket holders may also use their season tickets to gain admission on the day. Click below for details re stadium map, traffic and parking details. Cork claimed victory over Kilkenny in the league finale on Saturday in a cold and blustry Nowlan Park. Kilkenny started the brighest outscoring the visitors 1-8 to 0-6 points at half time. Conditions didn't improve for thse second half but Cork slowly ground their way back into the game but it wasnt until the 59th minute until they drew level 1-11 apiecce through a goal from Jack O'Connor. Kilkenny responded well adding a few more points of their own but Cork kept the scoreboard ticking over and it was a Jamie Coughlan goal in added time that proved decisive as the visitors claimed the victory on a scoreline of 2-15 to 1-16. Kilkenny Team for Play-off Announced. The Kilkenny team to face Cork in the Allianz Hurling League Play-off at Nowlan Park on Saturday has been announced. Click on Read More below for all the details. Throw in is at 2pm and tickets will be on sale at the Ground on Saturday. 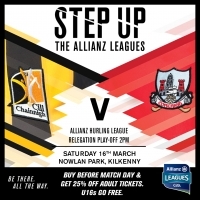 Kilkenny will take on Cork in the Allianz league play-off on Saturday March 16th at 2pm in Nowlan Park. Tickets for this game will be on sale in usual Centra and Supervalu outlets and online here. Please pre-purchase tickets to save and to speed up entry to the stadium on the day. Wexford claimed victory and more importantly all two points in the Allianz league fifth round in Wexford Park on Sunday. Kilkenny breeze assisted started the brighest in what was at times blustery and sleety conditions, opening up a 1-10 to 0-8 lead at half time. Wexford started the second half, wind assisted clawing the lead back with Kilkenny eventually surrendering on the 50th minute. From then on Wexford added more points to the tally but it was the goal on 66 minutes that sealed the win for the Slaneysiders on a cold and miserbale day.